Well, Mandy sometimes you just have to do what ya gotta do! 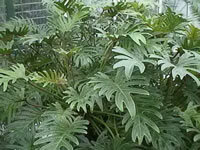 The Elephant Ear Philodendron or Selloum Philodendron, (Philodendron selloum) is very tough, so it can take a lot of abuse, and end up looking better in the end. I only hope that when you took the hatchet to it, you didn't have some sort of evil, crazed smile on your face. If I were taking on your project, (and I have done it many times). I'd go about it this way.....Try to think of yourself as a surgeon, use clean, sharp tools First I would slide the whole thing out of the pot, and lay it on its side on a bench, or the kitchen table. Usually, with a little patience you can find one or two of the pups which you can remove from the parent plant. If you do, just try to follow the roots into the ball, untangling as you go. If you happen to break a root or two, just clip them to a nice clean cut. The soil in the root mass is more than likely old and tired, so clean as much of it away as possible. Then I would use a sharp serrated knife, or hand saw to cut through the root ball, and then separating the plant portion as much as possible. I wouldn't cut the root ball into any more than quarters, myself....Make sure that all of the cut roots have been cleanly cut, and then dust the cuts with a rooting hormone such as Roottone. Allow the roots to remain exposed for a couple hours to allow the cuts to callous over before repotting with a good commercial potting soil. Don't water at all the first day, but then water very well, using the force of the water to wash down additional dirt down into the root zone. You will have to add more potting soil to replace what you have removed. Your new plants will go through quite a bit of shock in this procedure, so it'll take a while before they're looking great again. Hold off feeding until the plant has started to show signs of new growth.